If milk is supposed to do a body good (a human body, at least), then what is it that does an auto body good? This a question that any good auto body repair specialist would have the answer to. The human body and that of a machine actually share a lot of similiarties. Both require proper maintenance for optimal performance. And just like we would see a doctor to assess our health when we're injured, we take our automobiles to auto repair shops to have a professional repair that damages. You might be thinking, isn't that what my mechanic is for? As similar as they are, auto body repairers and mechanics have different specialized training. Auto body repairers work mainly on the exterior the vehicle while the mechanic works pretty much everywhere else. Auto body repairers and mechanics are great pairs when it comes to car restorations. If you've ever seen the show Pimp My Ride, these are guys who work together to tranform cars only an owner can love to cars everyone would love to own. 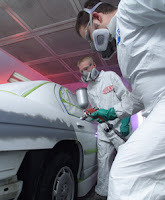 Those who choose the body repair route usually take an auto body repair collision course offered through a vocational program or local community college. These courses can take about six months to two years to complete, according to the Bureau of Labor Statistics. For most, if not all, automotive careers, learning is always continued with on-the-job training. In today's job market, certification in any industry including automotive has become increasingly vital. In May 2010, the BLS reported that the average annual wage of automotive body and related repariers was $38,130. Top earners made more than $64, 320. In recent years, the auto industry has been a popular topic of interest in terms of getting it back on its feet and workers back on the job. The BLS expected the overall job outlook for automtive body and glass repairers to grow by 19 between 2010 and 2020. With more drivers on the road, the demand for more automotive specialists to maintain their cars will also rise. Another plus to becoming a moden auto body repairer is that with new car designs there are new things to learn about working on them. This will provide a competitive edge for new auto body repairers entering the work force. Auto body repair is one of those fields that allows people to make a career out of a passion or hobby. For many others, their career paths are far removed from where they enjoy being the most. What's great about auto body repair is that it's an industry on the rise. Are you on your way up with it?